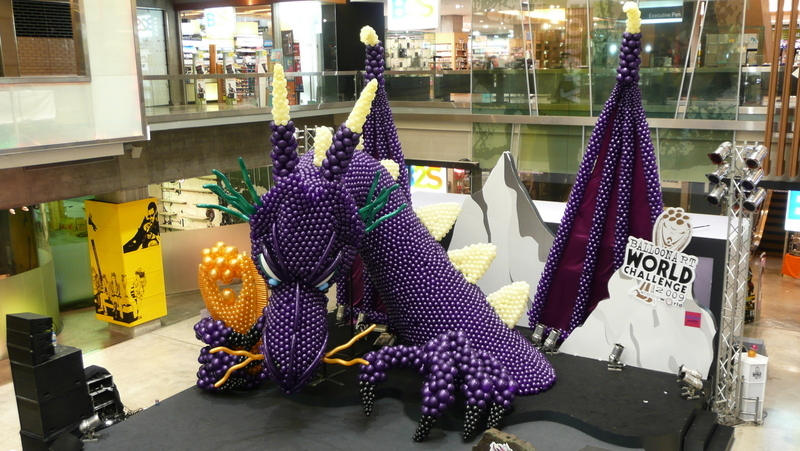 Recently, the Balloon Art World Challenge was held at Central World Plaza. One evening while we were there, I snapped some pictures. Pretty creative work, I think. A large green dragon chases a samurai. Chinese lions and a lucky dragon. Another dragon takes over the stage. Model wearing a balloon dress. 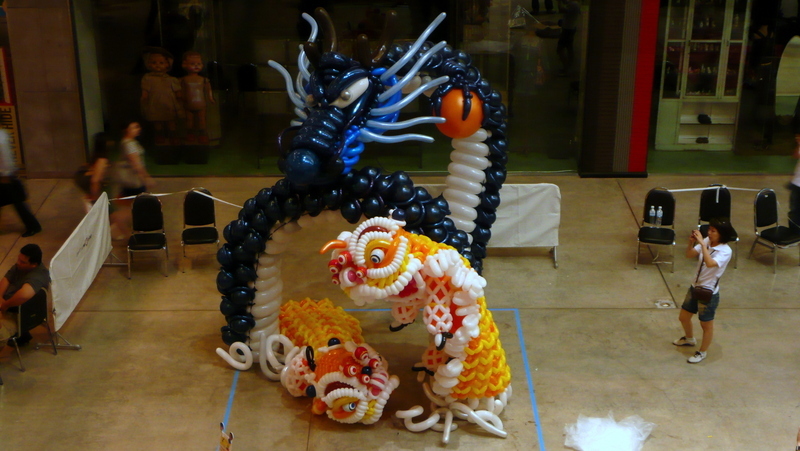 This entry was posted in Uncategorized and tagged Balloon Art, Balloons by christao408. Bookmark the permalink. I have this urge to run around with a pin. I like the Chinese lions and the lucky dragon best. The balloon dress is just wrong. Haha! She isn’t going to be able to sit down or relax! Made me smile that you’re listening to “Puff, the Magic Dragon.” I imagine it takes a lot of self-discipline to remain poised in a ballon dress. Matt described my feelings pretty succinctly. Man! That model in the balloon dress has to feel so uncomfortable, and so scared that one or two might pop in not appropriate areas. i’d be a little bit freaked to wear a dress like that! I like the greeen dragon. hahaha i love matt’s comment! funny thing, there is a balloon sculpture hanging in the convention center where i’m attending a conference; it’s in the shape of a jellyfish. @ElusiveWords – What he said. What do they do with the balloons when the show ends? I can still remember the shopping mall used to be so dark and unappealing before the renovation. It’s nice that we can access the mall through a waking skybridge now. 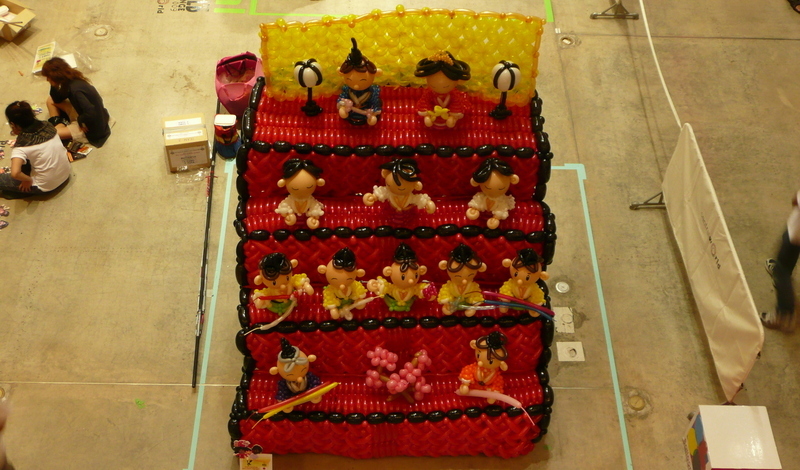 The balloon art challenge was very creative! @moptoplop – After the convention? There are tons of people running around with high-pitched, squeaky voices. @yang1815 – @ElusiveWords – I actually said that while there taking pictures. A pin or a straw and some spit-balls. @murisopsis – Sitting down would be all squeaky. @epiginoskete – You know how sometimes a song just jumps into your head? @ZSA_MD – Being Thai, I’m sure she has something on underneath to protect her dignity. Hopefully…@onmovement – Well, I’d be pretty freaked out to wear any dress, but a balloon dress would really be too much to handle. Wouldn’t flatter me in the least. @choyshinglin – That was my favorite, too. @kunhuo42 – Oooh, that would be cool to see. @CurryPuffy – They nearly doubled the size and reworked the mall so it is light and spacious now. There’s a very good Lao restaurant we’ll take you to next time we’re there. @christao408 – Ah, yes, indeed. Wow, very cool. I’m guessing this is one day only? I mean, being that balloons tend to deflate and/or get popped? Interesting though, I’ve never seen anything like this before. 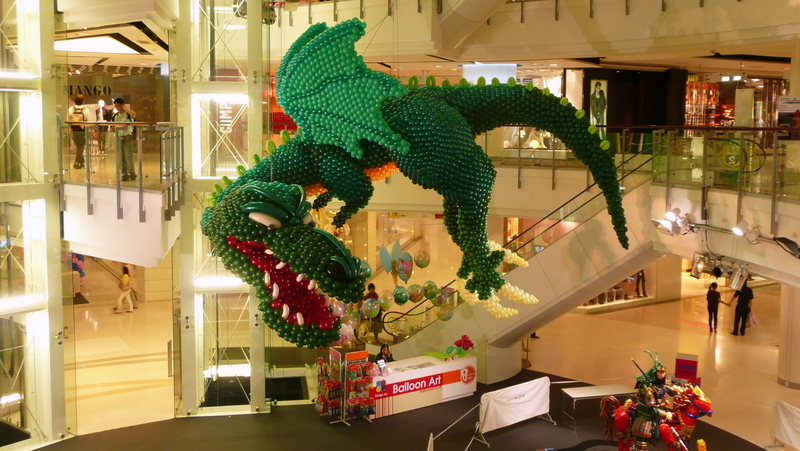 @christao408 – Wonder why there are so many dragons?! I love the Andy Warhol one. That is too cool! 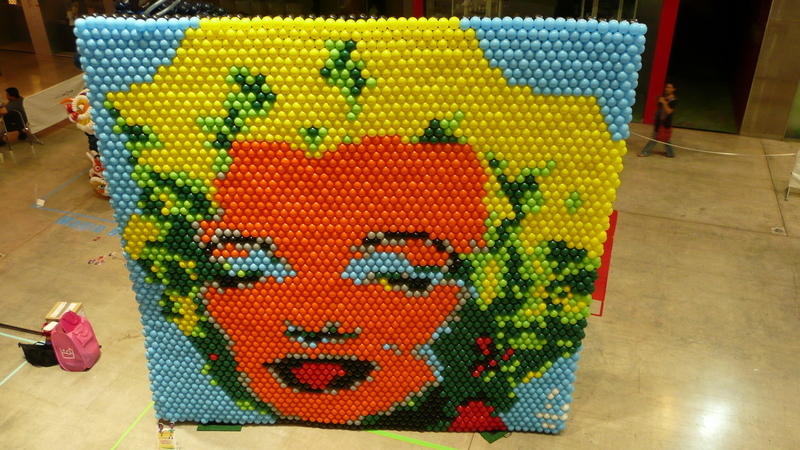 I wonder how long it took to make these… some of them look pretty labor intensive! @chow@ireallylikefood – I think it was a weekend or longer. Maybe they use something other than helium or some different type of balloon that doesn’t leak as much? @yang1815 – You know how those balloon artists are. They were all a bunch of D&D geeks back in middle school. (Which begs the question, why am I not a balloon artist today? )@TheCheshireGrins – I can only imagine how much time it took and the frustration they felt each time a balloon popped. “D’oh!! !”@WilldrawsRainbows – And if they can make a dress, why not an entire wardrobe? =D Thanks for your comment and subscription. @christao408 – Yeah why aren’t you a balloon artist? !